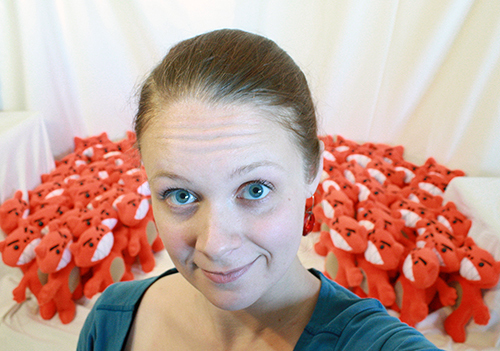 A while ago I shared what it was like to construct 65 very fuzzy, very orange Kobold plushies. 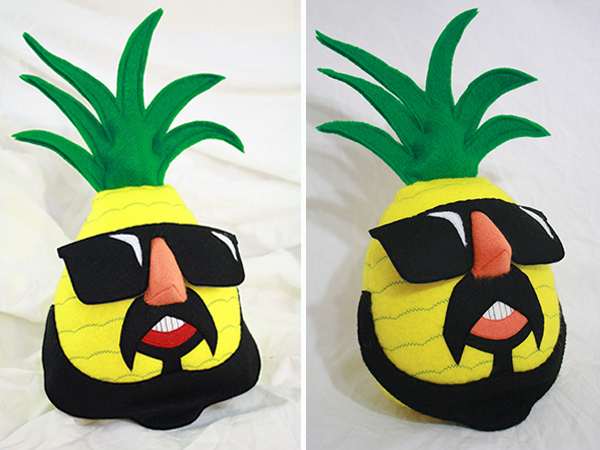 This week, I’m going to take you behind the scenes of some of the creation of 50 very cool, very sunglasses-wearing Pineapple Maki plushies. What fuzz levels did this project create? How many felt shapes did I have to cut out? 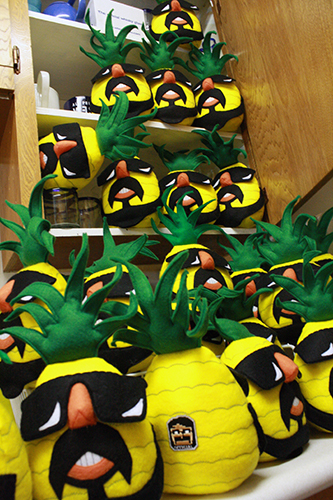 What does a kitchen crammed with plush pineapples look like? Read on to find out! First, of course, I got in touch with artist Maki Naro to propose the project. Maki is a very talented cartoonist and webcomic artist, the man behind the wonderful world of science comics at sci-ence.org, and more recently of the webcomic Sufficiently Remarkable. I first encountered Maki and his work when he appeared on the Penny Arcade reality “tv” (actually the internet in this case) show Strip Search. 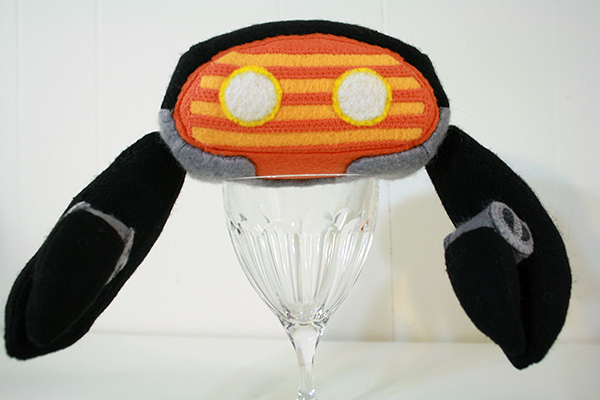 Maki was all for me making the plushies, and they became a special reward tier for his Sufficiently Remarkable Kickstarter. So after the Kickstarter completed, and after I finished making all those Kobolds, and after Desert Bus for Hope was past, I started making pineapples. 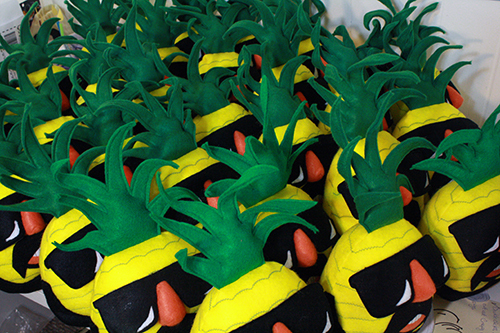 Lots and lots of pineapples. These were the two prototypes. After the first one, I got the general shape more round and less triangular, made the lip orange instead of red and narrowed the beard. 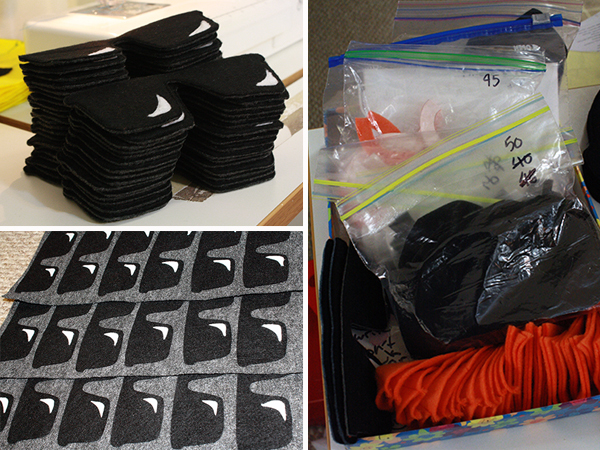 50 beards, the large top part – cut out several paper pieces in this shape, pin to two layers of black felt, sew around edge of shape, cut shape out just outside of stitches. Repeat until 50 have been created. 50 Pineapple leaves – trace card stock leaves template onto two layers of green felt, pin layers together, sew around edge of shape 1/4 inch inside pen lines (minus the bottom edge, which stays open), cut shape out just outside of stitches & inside pen lines. Repeat until 50 have been created. And then the actual construction could begin! 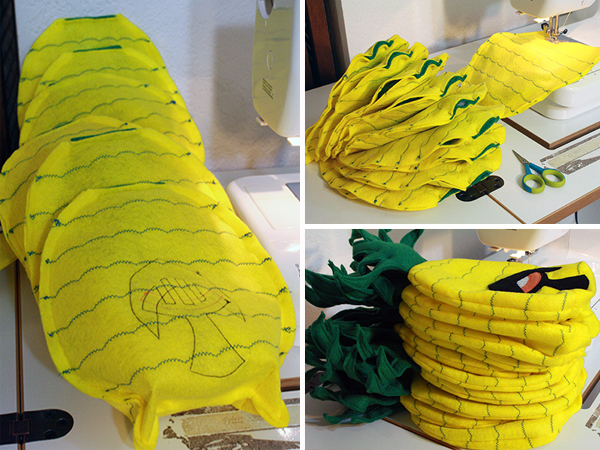 First, I had to sew the blue scalloped lines onto each of the 100 yellow pineapple body pieces. 6-7 lines per piece (it took me the first few to realize I could space them out nicely at 6 instead of 7, after which I kept them all nice and consistent), so I estimate I stitched between 600 and 650 scalloped lines. Of all the required construction steps for these dolls, that was probably the one I got most tired of doing. Then I could iron and sew the initial face pieces onto the front (in the proper layered order, of course), and the “official” patches onto the back. Then sew the two halves together with the leaves in between, square off the bottoms, turn them inside out, stuff them and hand sew the bottoms closed. 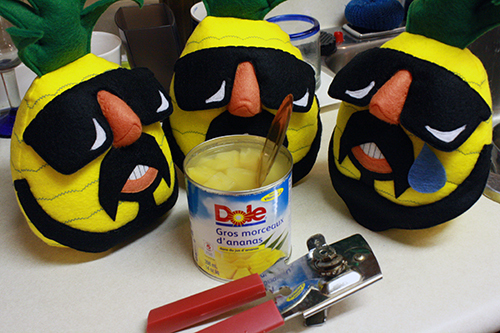 Then I could begin felting on the noses, then hand sewing the sunglasses and beards in place. 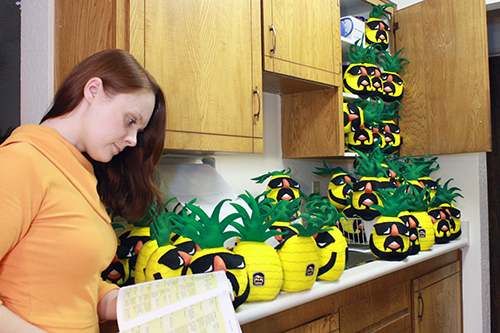 In the end, I estimated that all 50 Pineapples required roughly 2,500 – 3,000 hand stitches, on top of all the machine stitching. Happily, I’ve gotten pretty fast at both those things. I’ve found I like to mark dolls off a chart as I finish them – helps me feel like I’m making progress, and helps me chart just how much progress. As I completed the dolls, I’d also pose them for photo ops. 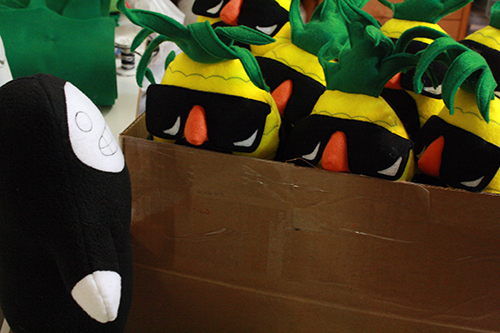 Their numbers kept growing, till my work room started to look like a Dole plantation. Eventually they moved out of there and infested the kitchen. I started looking for good Pineapple Upside Down Cake recipes. In the end, though, we came to an agreement and they each left quietly in little bubble mailers to find new homes around the world. 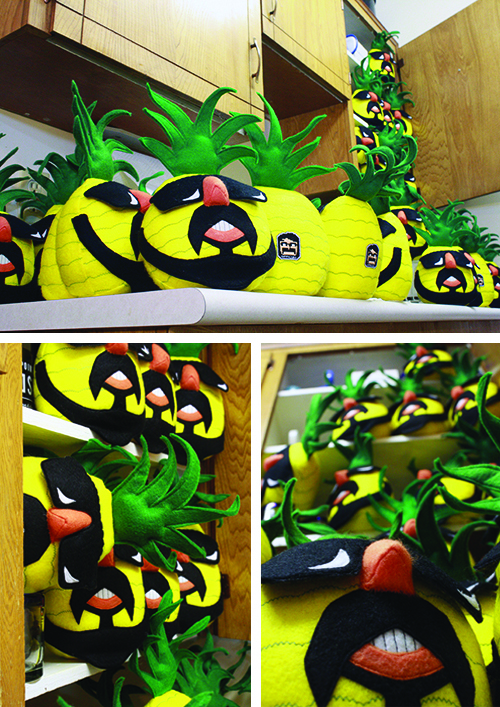 If you have procured a Pineapple Maki, I’d love to see a photo of it in its new habitat! And now, just like on high school exams, let’s have a “compare and contrast” segment! 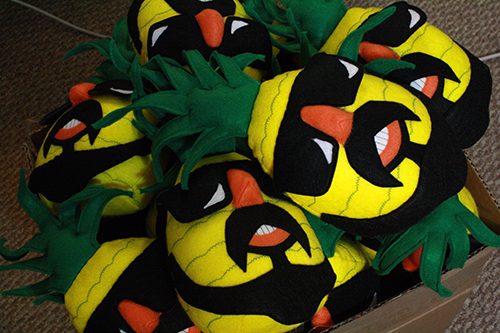 So how did this compare to my previous huge plushie project, the 65 plush Kobolds? Well, this series of dolls involved a fair bit more cutting out of pieces, and the stitching of the scalloped lines on every. Freaking. Body. Was a pretty massive pain. However, I was blessedly, ecstatically pleased to be working with felt again, and not that very soft and lovely and utterly maddening orange fuzzy fleece that got everywhere, on everything, and found its way with remarkable rapidity into every nook and cranny of my sewing machine. Also, these were easier to stuff. So, y’know, trade offs. So far it seems that every project has at least one step that is massively annoying, tedious or problematic, but every project also has at least one distinct advantage and/or manufacturing improvement over the last one. It’s always a new adventure! On a vaguely related tangent, I’ve discovered lately that there are all kinds of things I’ve made in the past few years that I’ve either forgotten or never found the right time to share. 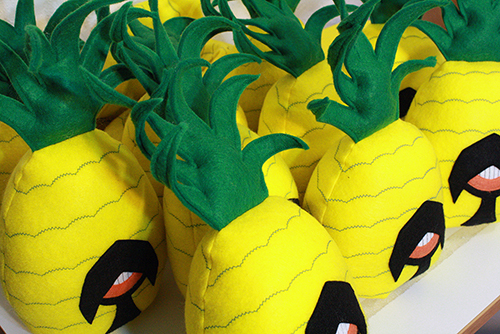 One of those things was a project that I cited when I first contacted Maki about making the Pineapple Maki plushies. I introduced myself and my idea, and provided some links and pictures that demonstrated that I at least sort of knew what in heck I was doing. 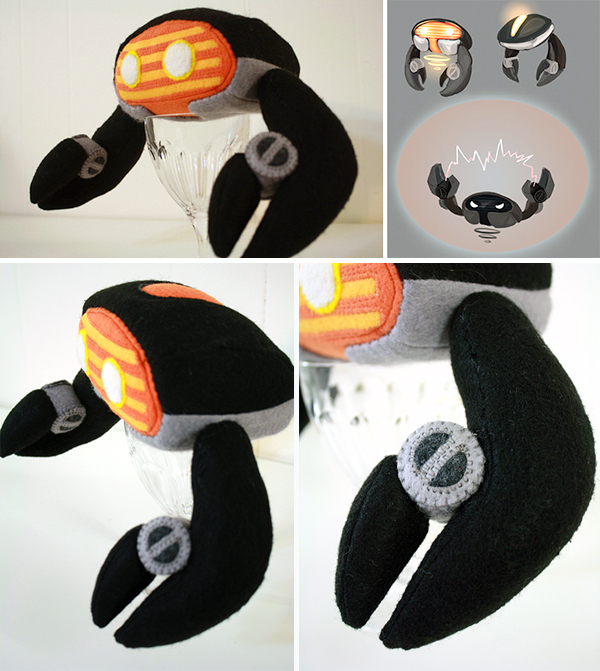 One of those pictures was a plushie that I’m still quite proud of, a crab-like machine creature that was a plush rendering of a video game character. To wrap up her studies at the end of her studies at Vancouver Film School, a friend of mine had to do a group project involving creation of a video game – concept art, characters, and I think at least partial or perhaps full game functionality. I don’t recall all the details. Long story short, for the final presentation of this project, the group thought it would be neat to have a doll of one of the characters. So my friend provided me with images, and I made a plush that matched them. I really like how it turned out, but I never did do a post about it. So I’ll close out this week’s post with photos of that rather nifty creation. Wow, that’s quite a project. They look really great. Grats on the success! 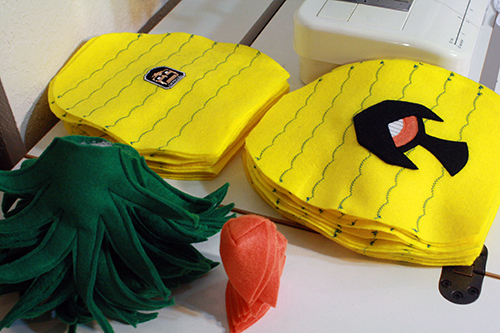 Did you keep track of the time it took to make all of the Makis, or just the hand stitches? Thanks! I didn’t keep precise track of the time, no – that gets a little tricky since it’s time I find or make in between all the other projects and the household chores and the day job, etc. But it certainly was quite a lot of time, I can say that for sure! :) If I had to make a guess, I’d say maybe 60 – 90 hours?